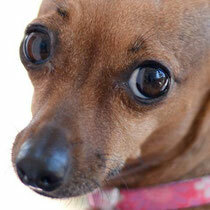 Misty is a petite tan Chihuahua with big beautiful brown eyes. She is sweet, smarty and spunky. Some of her favorite things are belly rubs, warm laps and chicken! She is a bit shy at first but once she warms up she is great with everyone. She plays with her foster buddies but prefers to sit on your lap and watch the action. Misty is the complete package. If you are interested in meeting Misty, please fill out our "Adoption Application"